Here’s a breakdown of how the investigation began and where it’s going. The investigation into the alleged hate crime reported by Empire star Jussie Smollett last month has garnered national attention. And as many details emerge that are either incorrect or have yet to be confirmed, we felt it important to layout the timeline of events that led us here. The actor files a report with Chicago police that he was the victim of a bias-motivated attack by two white men at 2 a.m. while walking home from a Subway restaurant. Smollett tells officers who conducted his first interview at his home an hour after the incident that the men used racist and homophobic language, punched him, and poured bleach on his body. He also states that they put a rope around his neck, which was still present on him when police arrived at his home. “This is MAGA country” was allegedly yelled during the incident. The actor tells police that his manager was on the phone during the attack and could corroborate the incident. Smollett then transfers himself to an area hospital, where he was treated by medical providers and held overnight. Elected officials and celebrities begin to release statements of outrage at the crime and support of Smollett. Many Democratic leaders immediately label the incident a hate crime, with Sens. Kamala Harris and Cory Booker using it to highlight antilynching legislation they have introduced. Major LGBTQ organizations also put out statements highlighting how the incident is connected to rising hate crimes in America that are often underreported. Chicago police provide an update that states they’ve reviewed “hundreds” of hours of footage and were able to find Smollett walking downtown. However, no footage shows an attack. Fox Studios confirms that hate mail had been sent to Smollett just one week before this attack that depicted a man being shot alongside hate speech. The FBI immediately launches an investigation into the mail. No suspects have yet to be identified, and Smollett is still considered a victim by Chicago police. Smollett’s family, which consists of well-known activists and actors, release a statement standing behind him. Smollett breaks his silence and releases a statement saying, “My body is strong but my soul is stronger.” He emphasizes that the incident was bias-motivated and speaks on overarching violence LGBTQ people, specifically trans people, face regularly that doesn’t get discussed. Police have not named any suspects in the attack and continue their investigation. Smollett makes his first public appearance since the event at a pre-planned concert in West Hollywood. He uses the performance to make more statements about the attack and passionately refers to himself as the “gay Tupac”. He also uses the stage to stress that he fought back against his attackers, who he identifies as white Trump supporters. Chicago police arrest two Nigerian men at O’Hare International Airport after their return flight from Nigeria and bring them in for questioning. Their home on the north side of Chicago is searched and it becomes known that one of them worked on Empire. Smollett's first media appearance is aired on Good Morning America, where he stands by his original story. He expresses anger at not being believed and says that naysayers "don't even want to see the truth." Sens. Kamala Harris and Cory Booker pass their bipatisan legislation in the Senate that aims to make lynching a federal hate crime. Smollet's story is used in statements before the vote. Reports also state that Smollett hired the men after finding out he was being written off Empire. Fox immediately denies the claim, stating he is integral to the show. The two men being held by Chicago police are named suspects in the case and will be held in custody for interviewing. No charges are filed and they are released after producing new evidence in the investigation. The Advocate confirms that Smollett does know the two men. Sources inform media outlets that the new evidence produced is a receipt showing the purchase of the rope used in the attack. Police confirm that these men are the two subjects found in released screenshots of video surveillance from that night. 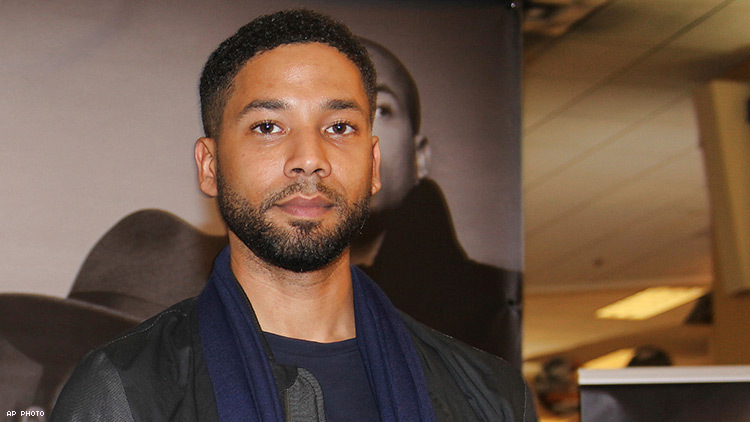 Smollett’s spokespeople confirm to The Advocate that the actor has retained high-profile defense attorneys who specialize in criminal investigations. A Chicago police spokesperson says this new evidence has changed the “trajectory” of the investigation and they’ve requested to interview Smollett immediately. Jussie Smollett's camp releases a statement through his new criminal defense team that denies all reports that the actor coordinated the January attack. “As a victim of a hate crime who has cooperated with the police investigation, Jussie Smollett is angered and devastated by recent reports that the perpetrators are individuals he is familiar with," his legal team writes. "He has now been further victimized by claims attributed to these alleged perpetrators that Jussie played a role in his own attack. Nothing is further from the truth and anyone claiming otherwise is lying." His camp finally confirms that the men did know Smollett and that one was a personal trainer he hired for a music video. They also state they are cooperating with police. The FBI and U.S. Postal Service expand their investigation into hate mail received by Smollett to include hjim as a suspect. The agencies would not confirm officially. The actor has yet to meet with Chicago police for follow-up interviews after the release of two men who have produced evidence that changed the "trajectory" of the investigation. Reports emerged Tuesday morning that Smollett's role in Empire is being reduced as production continues. His spokespeople would not comment on the reduction, but did state the actor has filmed many scenes already. The Advocate can cofirm that one noteable plotline that was going to debut this season and our magazine was breifed on days before the attack has in fact been finished. But spokespeople couldn't confirm if it will air. Chicago police announce they received a tip that Smollett was seen in his apartment building with the two brothers before the incident. They plan to interview the witness by end of day. Chicago police interview a potential witness and announce Smollett wasn't with brothers before the attack. The brothers are seen at the Chicago courthouse where they met with prosecutors but do not give a comment when leaving the building. An hour after their departure, the top prosecutor in Chicago, State's Attorney Kim Foxx, recuses herself from the case before any charges are made. The State's Attorney's office wouldn't elaborate on why. Chicago police name Jussie Smollett as a suspect in the investigation into his reported hate-incident. After weeks of investigation, police announce they believe the actor filed false police reports. A Grand Jury is empaneled and evidence is heard by police. The two brothers who say they witnessed the incident are interviewed for over two hours, according to their lawyer. Charges against Smollett are approved by the State's Attorney's office and he is indicted by Wednesday night for disorderly conduct related to the filing. He now faces a Class 4 felony. Detectives say they are negotiating his surrender by the morning. He will appear in court by 1:30pm local time on Thursday. Jussie Smollett is arrested Friday morning after turning himself at a Chicago police station. A press conference is held at police headquarters. The superintendent lambasted Jussie Smollett for filing false reports with the police and accused the actor of exploiting people believing victims of violence. The agency states that Smollett was motivated to orchestrate that attack due to salary issues he was facing with Empire. Fox Studios wouldn’t confirm or deny any issues between themselves in the actor. Backlash explodes against the actor across social media, including from President Donald Trump.